I love tacos. 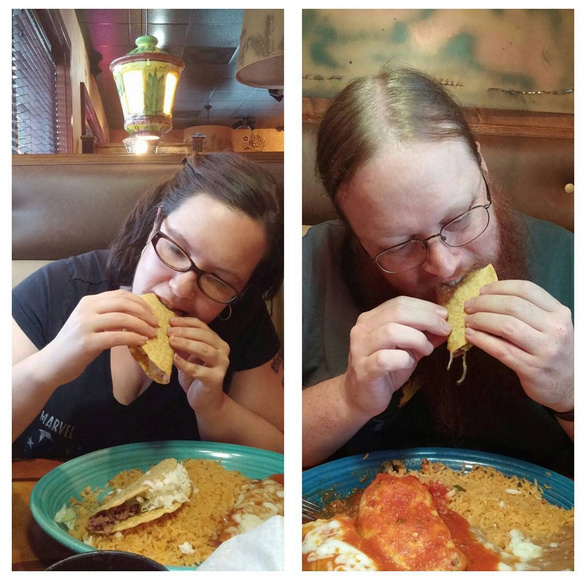 There are few things that I love more than tacos, so it is a pleasure for me to eat them. What is not a pleasure is having my dinner infected by sexism. But for the most part I sigh lightly and slide the check over to myself. Although my husband is the primary breadwinner in our household, I handle all our finances and so usually I pay for things. This particular restaurant visit went a little farther than that, though. With the exception of the time that I was ordering, the waiter never addressed me, just my husband. The check was pretty much the icing on the cake, but here’s how it went. Waiter: Would you like your check? Both my husband and I: Yes. The waiter comes back with our check and puts it in front of my husband. Before he walks away I slide the check in front of me. After inserting my bank card in the folder I slid the folder toward the edge of the table on my side of the table. My husband and I chat for a moment and the waiter takes the check away. We wait another minute or two and he brings the check back and sits it in front of my husband again. Breathing extra deeply, I wrote in the tip and signed the check. Am I saying this dude is intentionally sexist and an awful person? No. I’m saying that it is frustrating that the prevailing assumption is that when a man and a woman are at a restaurant the man will be paying. It was also frustrating that – aside from specifically taking my order – the waiter appeared to entirely forget that I existed. It turns out that I enjoy continued existence even in the presence of my husband.